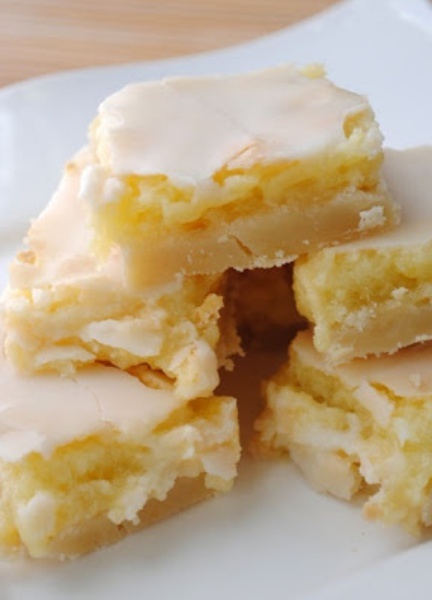 This Sunburst Lemon Bars is really simple and almost like sugar cookie. With lemon peel to pump up the flavor and it created a lovely, subtle lemon-scented crust. The filling is really light. It's not as thick as other lemon bars. Note: You'll need about two lemons for the juice/peel in this recipe. If you don't have enough lemon juice left for the glaze, add water until you get the right consistency. Heat oven to 350°F. In large bowl with electric mixer, beat flour, sugar, butter, and peel on low speed until crumbly. Press mixture evenly in bottom of ungreased 13x9-inch pan. Bake 20 to 30 minutes or until light golden brown.